Pole of inaccessibility…I admit I was shocked to see that South Dakota claimed such a dubious geographical title in a recent issue of National Geographic. South Dakota is technically not the geographical center of North America; that title goes to North Dakota. 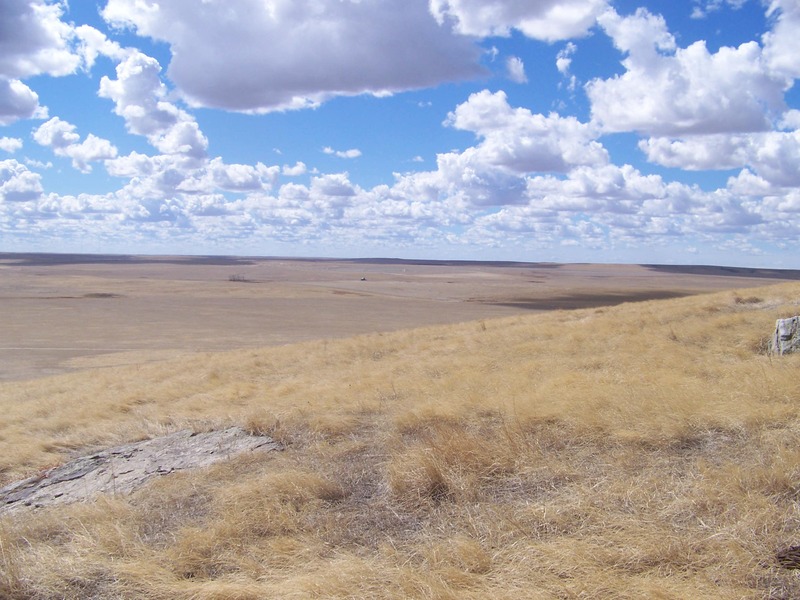 South Dakota, however, does carry the rather obscure title of being a pole of inaccessibility for the North American continent, the point farthest from all North American shorelines. Basically, if you live in South Dakota, you live at least 1,000 miles from a coast…any coast! Perhaps our isolation from the ocean is more than a physical measurement on a map. How often do South Dakotans think of living on an ocean planet? Indeed, our perception of the world is seemingly skewed considering we live smack in the middle of that 30% we call land. Living in South Dakota, it is easy to forget about the ocean and its impact on our daily lives. We live as far from it as one can in North America; yet, we are inseparably bound to it. The seafood you eat, the nearly subconscious purchases of foreign goods you make, the moisture we receive, the crops you sell, and even a large portion of the air that we breathe link us all to the ocean’s central value in our lives; therefore, understanding the ocean and the ocean sciences is vital to our daily lives even to landlocked South Dakotans. Here is where the National Oceanic and Atmospheric Administration and the Teacher at Sea program come into play. It has become obvious to me since my selection as a Teacher at Sea that very few people in this region associate NOAA with ocean research. They seem to know that NOAA plays a role in researching the atmosphere such as working with the National Weather Service to forecast storms, but they never make a connection to the ocean even if it is the second word in NOAA’s namesake. It is understandable that South Dakotans in general would assume this because the only exposure we have to NOAA in this part of the country deals with storm and weather forecasting. In reality NOAA operates a fleet of ocean research vessels that cover the expanse of U.S. waters and beyond in order to increase our understanding of what we really have in our oceans and how it all interacts with each of its differing component parts. Also, NOAA has its own uniformed service called the NOAA Corps, which keeps the fleet operational and aids and assists in ocean research. My goals as a Teacher at Sea are twofold: connecting NOAA’s oceanic and atmospheric work to the classroom and connecting students to the education and training-related pathways that could potentially lead to NOAA careers. Essentially, I am to learn and document as much as I can on my cruise and use this experience to enhance the education of my students and to provide access to possible careers in oceanic and atmospheric work through NOAA. I am greatly thankful and humbled to receive such an opportunity through the NOAA Teacher at Sea program. This is truly a great opportunity for learning for both me and my school. 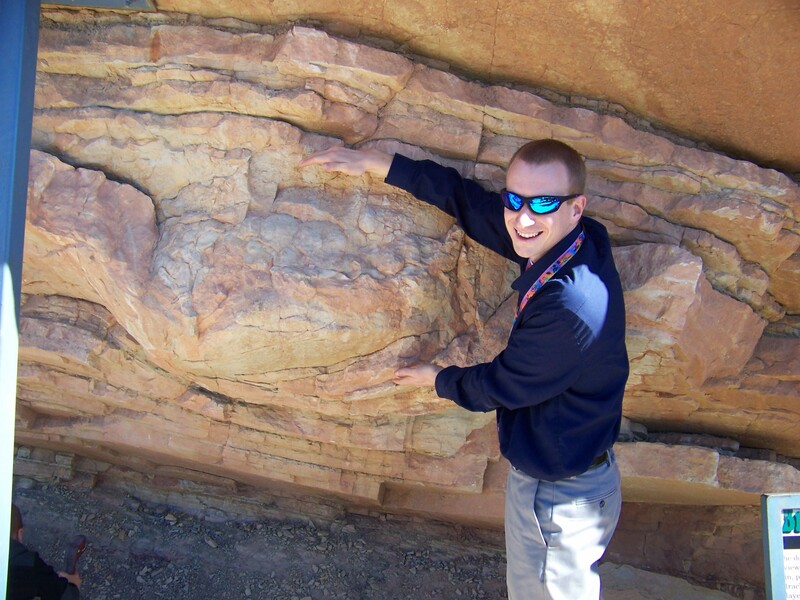 I enjoy geology, paleontology, and many other sciences. It is probably a safe guess that a large dinosaur left this track behind. More about me…I will be starting my ninth year of teaching in Hoven this August. I teach 7-12 science: Earth, Life, Physical, Biology, Biology II, Chemistry, and Physics. I enjoy teaching all of the varied sciences. It is hard to get bored when you teach everything. Hoven is a very nice town to live and teach in. It reminds me a lot of growing up in Veblen, another small, rural South Dakota town. I have always been an advocate for rural education and strongly believe that small schools like Hoven offer an exceptional learning environment for students. Unfortunately, I will have to leave my wife, Jill, and my daughters, Teagan and Temperance, behind for a few weeks. I will miss them, but also realize that my four-year old daughter being present on a research vessel would make any productive research almost impossible. She is very rambunctious. I am counting down the days until I fly out on the 26th to Pascagoula, Mississippi, where the Pisces will be leaving and returning after the mission is completed. I am very excited about the research involved in my upcoming mission. Researching fish species abundances associated with the topography of the Gulf of Mexico has so many implications because our mission is just a small piece of a giant survey puzzle that includes nearly the entire edge of the North American shelf in the Gulf of Mexico. Ships in the survey area have been using many innovative ways of monitoring reef fish abundance. I look forward to learning more about this technology and will report more on the subject once I am underway. For more information about the Pisces, visit the Pisces homepage or track our movements using the NOAA ship tracker. 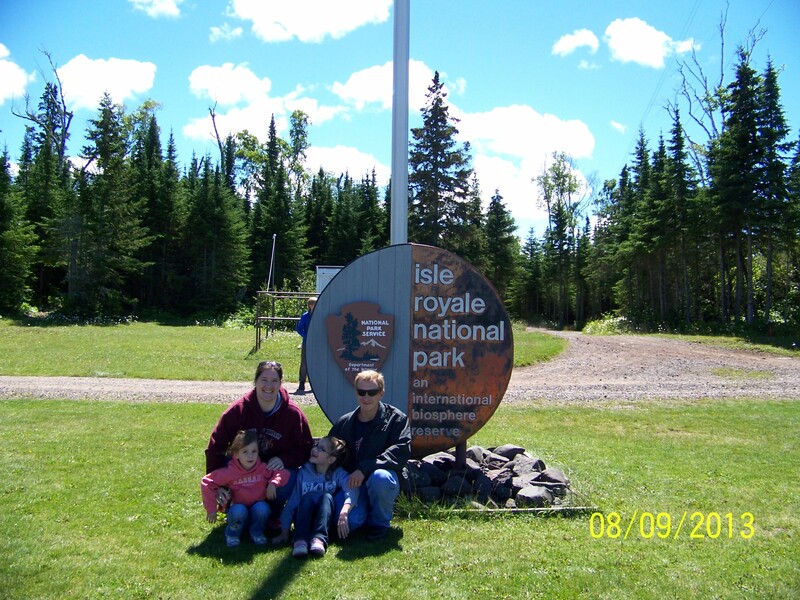 My wife and two kids on vacation at Isle Royale National Park in the middle of Lake Superior. This entry was posted in 2014, NOAA Fisheries Service, NOAA Teacher at Sea, Spencer Cody and tagged North Dakota, Pisces, reef fish, South Dakota. Bookmark the permalink.